Coral Gables Police are looking for a Christmas Grinch who robbed a 7-11 on the 3900 block of SW 8th Street Sunday. Police said the man walked into the store carrying a Christmas gift bag and waited briefly behind a customer before pulling out a handgun and demanding cash. The thief demanded the money be put into his gift bag. 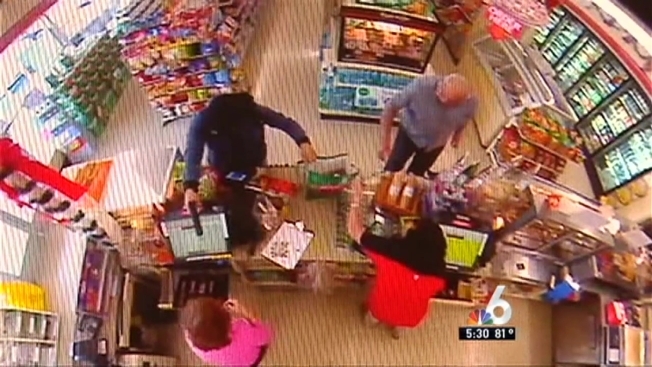 Detectives said the armed robber took about $400 before calmly walking out of the store. Coral Gables Police said he was last seen walking towards Salzedo Street. Police described the thief as being approximately 5’6”, between 35 and 40-years-old with a graying goatee. He wore a black skull cap, aviator glasses, long-sleeve purple hooded zip-up jacket and blue jeans during the robbery. If you have any information about the identity of the suspect, call Coral Gables Police at 305-442-1600 or Miami-Dade Crime Stoppers at 305-471-TIPS (8477).